We use the latest technology to make your appointment for crowns timelier and more comfortable. When you have a tooth with significant damage or fillings, your dentist might recommend a crown. Instead of trying to fill many different spots and weaken the integrity of your tooth, crowns are basically new, false teeth cemented to the existing roots of your natural teeth. 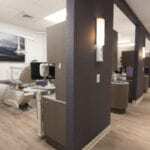 In many dentist offices, the process of placing a crown can require two or more visits; however, here at Dental Oasis of Clayton, we have technology that allows our Clayton, North Carolina patients to get a crown placed in just one appointment! In order to place a crown, a dentist needs to reduce the problem tooth until it looks something like a tree stump. This newly shaped version of your tooth will be the foundation that the crown is cemented to, and in turn the crown will be protecting the tooth. At many other dental practices, they would need to send you home with a temporary crown while the permanent one is manufactured from a dental impression in a lab, and then the dentist will place it during another appointment. At Dental Oasis of Clayton, we decided to cut out the middle man and manufacture a crown from your own digital impression with the latest technology right here in our office. Our CEREC machine takes the digital impression of the tooth and will mill a crown from a solid block of porcelain that will be a perfect replacement for your tooth. Most but not all patients are candidates for CEREC crowns, and your doctor will decide if a CEREC crown is right for you. If you are nervous about the dental work that is required when getting a crown, please let us help relieve your anxiety here at Dental Oasis of Clayton. Our dental techniques are very gentle, and we have many different ways to help our anxious patients feel calm and relaxed during their procedures. If you have questions about crowns or other dental work, please contact us today!